No washing. No clogging. No daily calibration. Vision CBA and FCS Express Software enable automated data output to pre-set data layouts for individual cell-based assays. Users have the option to modify the automatic gating with instant visual display and data update. Data layouts can be modified to accommodate multi-sample analysis and create customized analysis and / or quality control reports. Fluorescent dyes that stain DNA can be used to identify nucleated cells in a mixed cell population. Acridine orange (AO) is a nuclear staining (nucleic acid binding) dye permeable to both live and dead cells. It stains all nucleated cells to generate green fluorescence. Fluorescent membrane-exclusion dyes that stain DNA can be used to identify dead nucleated cells in a mixed cell population. Propidiom iodide (PI) is a nuclear staining dye that can only enter cells with compromised membranes. Healthy cells exclude the dye. Dead nucleated cells stained with both AO and PI fluoresce red due to fluorescence resonance energy transfer. Because platelets and mature mammalian red blood cells don’t contain nuclei, only mononuclear cells produce a fluorescent signal. Fluorescent-positive live and dead nucleated cells are easily counted and red blood cells are excluded from cell counts. There is no need to lyse red blood cells, saving time and eliminating an extra sample preparation step. This also allows technicians to use a single viability method for analysis of both fresh and processed blood, bone marrow, and digested tissue samples. Red blood cells seen in the bright field image (red arrows, left image) are not visible in the fluorescent image on the right. Red blood cells are excluded from cell counts. The Vision CBA Image Cytometry System features two user-changeable fluorescence optics modules. The robust modules are easily removed and replaced. Available modules cover a spectrum from UV to far-red, enabling analysis of a wide range of fluorescent proteins, dyes, and fluorophores. *This table is a partial list of compatible fluorophores, nucleic acid stains, and fluorescent proteins. Please contact Nexcelom technical support regarding compatibility of other reagents. In addition to dual-fluorescence viability, the Vision includes a default assay for cell concentration and % viability for cultured cells stained with trypan blue. Other bright field stains, such as Methylene Blue and Erythrosine B, can also be analyzed using Cellometer cell counters. Live cells are circled in green. Dead cells are circled in red. Primary hepatocytes (both fresh and cryo-preserved) are routinely used to test potential drug candidates for toxicity. Seeding with identical numbers of viable cells is important for accurate toxicity experiments. Due to their variable morphology and tendency to clump, hepatocytes can be difficult to count manually or with other automated cell counters. The Cellometer Vision features specialized algorithms for accurate counting of hepatocytes. Dual-staining with AO/PI enables counting of live and dead hepatocytes for automated viability determination. Bright field image (left) shows the variable morphology of primary hepatocytes. Dual fluorescence image (right) shows counted live cells (circled in green) and counted dead cells (circled in red). Hepatocytes are quite fragile. Because the Vision images cells directly from the counting chamber, the shear stress present in flow-based systems (where cells travel through the instrument) is eliminated. Because hepatocytes lose viability over time, it is important to complete the analysis very quickly. Staining with the Cellometer AO/PI viability reagent and loading of the counting chamber takes just 1 minute. Analysis with the Cellometer Vision is completed in less than 60 seconds. The Cellometer Vision (10x) Image Cytometry System is optimized for simple, 1-step determination of yeast concentration and viability in messy samples. Fluorescent nuclear staining dyes are used to stain live and dead nucleated cells. Learn more about the AO/PI dual-fluorescence method. The Cellometer Yeast Viability Kit was specifically developed for dual-fluorescence analysis of yeast in samples containing corn mash. Reagents for viability of yeast in samples containing corn stover, sugar cane, and biomass are also available. Contact Nexcelom technical support for more information. Bright field and fluorescent images of yeast from corn mash. Debris visible in the bright field image (above left) is excluded in the dual-fluorescence image (above right). Only live (circled in green) and dead (circled in red) yeast are counted. The Cellometer cell roundness setting can be adjusted for recognition and counting of irregular-shaped cells, such as RD cells, activated T-cells, and hepatocytes. More than 1,600 different cell lines have been successfully counted using Cellometer Systems including the NCI-60 human cancer cell lines developed by the National Cancer Institute. The MCF-7 breast cancer cell line can be very clumpy. The Cellometer pattern-recognition software identifies and counts individual cells within these cell clumps for accurate analysis (shown at right). For clumpy cells with poorly-defined edges, the Vision offers fluorescent counting. Cells can be stained with a nuclear dye, such as acridine orange (AO), then imaged and counted in the fluorescent channel. Nexcelom has designed specialized (PD-300) counting chambers to accommodate large cells, including adipocytes. The controlled chamber depth eliminates potential problems caused by the buoyancy of adipocytes. Imaging directly from the counting chamber eliminates the shear stress present in flow-based systems where cells travel through the instrument, making accurate analysis of fragile adipocytes possible. A fluorescent nuclear dye, such as acridine orange, can be used to more easily identify nucleated cells in samples containing debris. The Cellometer Vision automatically generates a cell size histogram based on cell diameter. Adipocyte cell size histogram showing variation in cell diameter from 44 to 202 microns. Minimum and maximum cell diameter settings in the Cellometer software can be optimized to count specific cells in a sample. The example below demonstrates counting of mature dendritic cells cultured from PBMCs based on cell diameter. Bright field and fluorescent counted images of macrophages stained with Calcein-AM for detection of metabolically-active cells. Debris and dead cells in the bright field image (left) are not visible in the fluorescent image (right). View Bright Field Images to check cell morphology. Automatically Save raw images and data to a secure network location. Capture Colorized Images with screen-capture software for use in publications and presentations. Print images and custom data reports directly from Cellometer software and FCS Express. Cellometer Disposable Counting Chambers consist of two independent enclosed chambers with a precisely controlled height. Cell suspension of 20 microliters is loaded into the chamber using a standard single channel pipette. The chamber is inserted into the Cellometer cell counter and the cells are imaged directly from the chamber. This simple sample loading and analysis method is ideal for fragile cells. On-site demonstrations allow users to evaluate a critical cell type or cell-based assay prior to making a purchase. Technical seminars are a great way to introduce Cellometer cell viability and cell-based assays to multiple users within a lab or organization. Free on-site installation and training are available to all Vision and Vision CBA customers. Web-based support sessions are available to all Cellometer customers at no cost. Nexcelom technical support specialists can assist with creation of new cell types, optimization of counting parameters, and analysis of cell-based assays. Comprehensive Protocols for a growing menu of cell-based assays assist with sample preparation, imaging, and data analysis. Detailed, step-by-step instructions with screen shots enable new users to run Cellometer kits for cell cycle, apoptosis, cell viability, and other assays. Cellometer Vision vs. Vision CBA: Which System is Right for Me? The Cellometer Vision and Vision CBA are specifically optimized for concentration and viability analysis of complex cell samples and unique sample types. Unlike the standard Cellometer Vision, the Vision CBA features an additional light source (HSL Module) for enhanced sensitivity and FCS Express 4 Flow software for advanced population analysis based on fluorescence intensity. Assay data is displayed in a table and also as a scatter plot or histogram for simple identification and measurement of unique cell populations. The table below compares Vision and Vision CBA capabilities for a number of popular cell types and cell-based assays. *An incomplete listing of popular fluorophores, dyes, and fluorescent proteins that are compatible.Customized optical modules in the UV to far-red range are available. E-mail support@nexcelom.com or call 978-327-5340 for more information. Installation Qualification (IQ) and Operational Qualification (OQ) package for the Vision instrument. Please inquire for scheduling and pricing. Bright field imaging, fluorescent imaging and pattern-recognition software to quickly and accurately decluster, identify and count individual cells. For customized optical modules, email support@nexcelom.com or call: 978-327-5340. 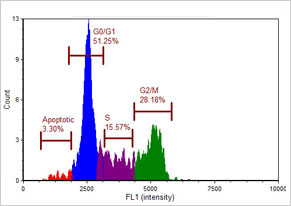 Incorporation of FCS Express Software into the Vision CBA Analysis System has enabled users to conduct image-based analysis of cell-based assays requiring enhanced gating for the most accurate, reliable, and reproducible results. Side-by-side comparison of results for apoptosis, cell cycle, mitochondrial potential, autophagy, ABC transporter assays, aggresome detection, CD4+ / CD8+ immunophenotyping, and other assays has shown Cellometer image-based analysis results to be comparable to flow cytometry. Flow core labs can utilize the Vision CBA instrument to pre-screen samples prior to sorting and flow cytometry analysis and to run 1-color and 2-color assays for cell cycle, apoptosis, GFP transfection, mitochondrial potential, and more … freeing up their flow system for the more complex studies. Individual researchers performing simple 1-color and 2-color analysis appreciate the simplicity and accessibility of the Vision CBA. The ability to analyze samples right away, using only 20µl of sample, enables researchers to accelerate and expand their experiments. Researchers can analyze a number of time-points, rather than one endpoint result. The FCS Express Software offers straightforward data analysis procedures and outputs familiar to many flow users. As shown in the Nexcelom data layout to the left, FCS Express Software plots data based on fluorescence intensity and default gating parameters. The data table displays the cell percentage and cell concentration for each phase of the cell cycle. Gating is manually optimized by dragging the gating bars in the histogram. Cell percentages and concentrations are instantly updated in the associated data table. For analysis of Apoptosis with Annexin V-FITC / PI, FCS Express Software generates colorized scatter plots indicating live, apoptotic and dead cells with an associated data table indicating the % of cells and cell concentration in each category. The Cellometer Vision CBA has removed the variances regarding human error and subjectivity testing essentially overnight from our operations! The Cellometer Vision CBA Image Cytometer is a great machine! It gives very precise results in a very short time, and only uses a small amount of sample, which makes it very efficient for research purposes. Using the Cellometer Vision CBA has saved me so much time! I am able to get consistent viability data with much less time spent on sample preparation. It has also been great to complete cell cycle analysis without using FACS. I love the ability to rapidly count mouse white blood cells and red blood cells without the hassle of needing to lyse the red blood cells with the Cellometer Vision CBA! The AO/PI solution makes this process a breeze. I frequently use the Cellometer Vision CBA and I really like it! The Cellometer Vision CBA makes my life so much easier! It makes cell counting a breeze! It is quick and very easy to use. You can count your cells with a turn of a knob and with a click of a button! The Cellometer Vision CBA works great and is really efficient. Earlier, I used to work with the Cellometer Auto T4 but then switched to the Vision CBA. With the Cellometer, I consumed less time and it helps me get research work done effectively! The Cellometer Vision CBA definitely saved me from spending hours on the microscope counting cells and it spared me the need to understand complicated FACS analysis. We use the Cellometer Vision in our lab. We love this machine! It always gives us quick and clear cell counts! The Cellometer Vision CBA instrument quickly counts cells and measures viability. The instrument is quick and easy to use. Counting cells using the Cellometer is much easier than using a hemacytometer! Our experience using the Cellometer Vision CBA has been great! It is so useful. We recommend the instrument due to convenience and speed of reading. The Cellometer Vision CBA has helped me complete my experiments much faster! The instrument allows for rapid cell counts and even has a tool that can help calculate the cell concentration in no time. I love the counting chambers that are easy to load as well! The Cellometer Vision CBA makes counting cells so much easier and less labor intensive! The Cellometer Vision CBA has greatly streamlined our cell counting activities and its versatility has enabled us to customize many unique counting protocols for different cell lines. All in all, well worth the investment! The Cellometer Vision CBA is very helpful with cell viability and plating. It really saves time! The Cellometer Vision with your specialized chlorophyll fluorescein module will save us countless hours of microscope work by providing a reliable viability count of cells in a matter of minutes. We love it! The Cellometer Vision CBA has helped us optimize a lot of our experiments. Not only is it fast and reliable, but it is easy to modify and create assays within the program. I would recommend it to others! The Cellometer Vision CBA has provided highly trustworthy and fast results using the powerful algorithms for automated image-based cell counts and flow-like analysis. Plus, there is no need to clean up the instrument and it is a very user-friendly interface. I highly recommend it! Our Cellometer Vision CBA allows us to easily and accurately perform cell-based assays for our drug resistance experiments! The Cellometer Vision CBA is by far the best product we have used in our lab. In such little time, this small machine can capture images, analyze data and upload your data into a neat powerpoint that can be used immediately. We have used this machine for apoptosis assays and cell cycle assays and it has not disappointed! The Cellometer Vision is a great product! The instrument is quick and easy to learn to use, and the software is very user-friendly. We have used our Cellometer to obtain data that we would normally have to use the flow cytometry facilities to get. The machine has made a number of data types both inexpensive and quick to obtain. In addition to the product itself, the customer service we have received is excellent – only adding to the quality of the product!